“I know your works: you are neither cold nor hot. The world is a cosmic Tabernacle. The first domain of Mediatory Man was between the waters. The waters below (springs) were necessary for life but they were not “a place to live.” The waters above did likewise. However, these were temporary veils, boundaries to be crossed in an increasing advance-by-faith. We saw Voyage of the Dawntreader last night. Biblical themes and symbols abound. Of course, the story follows the Bible Matrix formula, but the message of a courageous Maturity via Testing at God’s hand, in such a visual form, was striking, especially for young people. All the characters are transfigured by the end, particularly Eustace, whose cowardice and courage were really the heart of the proceedings. Narnia is foolishness to him, but a time in the wilderness gives him a different Spirit. He moves from the unbroken natural, through brokenness, to a humble, spiritual wisdom that judges rightly between good and evil. The final scene encapsulated everything I have been trying to communicate concerning baptism. It pictures the reception of saints into government as enrobed heavenly elders, God’s council of wise men who sit at court with Him as Great Prophets, co-Mediators. Although only one character “passes across” into Aslan’s country, all the saints “pass through” in their return home as human argosies of wisdom and understanding. Wise distinctions and tough decisions must be made before the crystal walls and gates. “Or, perhaps, with Peter Kreeft, one might interpret purgatorial cleansing as a form of heightened and perfected awareness, effected by the light of God’s presence as an illuminating and purifying fire. Thus, in death, in coming face-to-face with God, we finally see ourselves as we truly are, the depths of our own sin and brokenness, and all the consequences and ruin wrought by our own sin and unfaithfulness in our own lives, the lives of others, and the ongoing life of our family, church, and world. The dietary Laws given to Moses were an expansion of the command given to Adam. It is the self-denial of priestly obedience to God. Adam wasn’t ready for the tree of judicial responsibility (kingdom) but he seized it. In the greater Bible picture, Israel’s history (from Moses) is this period of priestly obedience. But Jesus came and reversed Adam’s failure. Consequently the dietary laws are revoked, and with greater maturity, the people of God (through the first century death of Israel and her resurrection as the church) now, like Jesus, have the judicial wisdom of the Spirit, and the power to eat unclean things (Gentiles), consume them and make them clean. Only the power of resurrection can enter a room with a corpse in it, touch lepers and feast on Gentile meats and not be made unclean, but instead make the unclean clean by consuming it. This is the power of the New Covenant. The Bible is big on mediators. Adam’s role as faithful Showbread would link heaven and earth. He would be a god-man. Fulfilled by Christ, this is the liturgical role of a minister. He faces God as representative of the Bride, and faces the church as the representative of the Bridegroom. He is Solomon at the completion of the Temple dedication. The ‘hell’ hybrids are the Land-beasts of the Bible. This is what Adam became, conspiring with Satan. It was an unholy alliance between God’s mediator and the Creation, in which the Creation called the agenda. The resulting peoples are hunters like Nimrod and Esau, wolves instead of shepherds, bloodthirsty children of the daughters of men. In his Esther lectures, James Jordan observes that Ahasuerus is pictured as being enthroned over his very own crystal sea. Nero was the first ruler in history to be buried in porphyry. For this ‘bad Ahasuerus’ who exercised false judgment, the crystal sea became a laver of fire. We know from Revelation 14:10 that the lake was before the heavenly throne. Herod’s Temple was covered in marble. Revelation shows it replaced with a crystal city. The church is now the Laver. 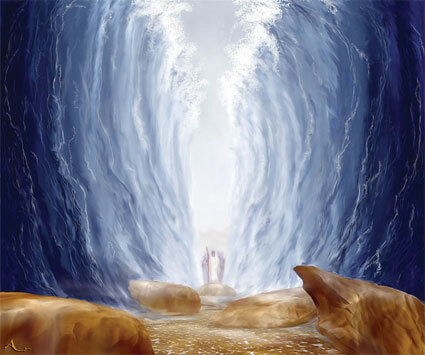 Baptism symbolises the gospel as walls to the wicked and gates to the righteous: fire and ice. Jesus’ kingdom is the fifth empire and His judgment is righteous and uncompromising. It might look like I’m colouring outside the lines, but it’s in line with a very consistent Biblical symbolism.